Chaco (or Gran Chaco), a large area in central South America divided among the countries of Argentina, Paraguay, Bolivia, and Brazil. It is in a sense a northern extension of the Argentine pampa, though, unlike the latter, the Chaco is broken up into alternating patches of open grassland and more or less scrubby woodland with the latter predominating. The area is a flat alluvial plain composed of unconsolidated sands and clays. Hills are almost nonexistent, and rarely is solid rock or even a solitary stone or pebble to be found. Geologists are of the opinion that this area was at one time the bed of a great inland sea which for ages since has been receiving the alluvial washings from the foothills of the Andes. Except for the Bermejo River and the Pilcomayo, which forms the boundary between the Argentine and Paraguayan Chaco, the region is drained imperfectly by small channels leading toward the Paraguay River. Some swampy areas and marshes appear during the rainy season, but the idea conveyed by some writers, that much of the region is a swampy area covered with water most of the time, is misleading. Various explanations have been given of the origin of the word "Chaco." Perhaps the most plausible is that the word comes from the Quechua Indian word "chacu," which means an abundance of animal life (hence the term hunting ground as sometimes applied), the Spanish changing the word to "chaco." The part of the Chaco south of the Bermejo River is known as the Chaco Austral; that between the Bermejo and the Pilcomayo as the Chaco Central; and that north of the Pilcomayo as the Chaco Boreal. Though the boundaries of such an area are somewhat indeterminate, the Gran Chaco, as the entire region is sometimes called, covers 200,000 square miles or more. The Paraguayan Chaco, with which this article is primarily concerned, consists of that part of Paraguay lying west of the Paraguay River, approximately 100,000 square miles, or close to two thirds of the area of the entire country, the rest lying east of the river. These two parts are quite different and had little contact with or influence upon each other until the 20th century. Paraguayan population figures of the 1950s are only estimates, but the Chaco inhabitants, many of whom were Indians, probably numbered less than 100,000 in the mid-1950s, as compared with the 1,000,000 or more in Paraguay proper. The chief Indian tribes at that time included the Maccas, Lenguas, Chulupis, Tobas, Chiriguanos, Chamacocos, and the savage Moros who attacked and killed several Mennonites in an outlying village. Probably coming from the Andes, many of the more remote Chaco Indians show marked Quechua features. These tribes, unlike the Guaranis in Paraguay proper, have entered little into the history of the country, and their chief influence had been to make the Chaco so inhospitable to the white man that its inhabitants were familiarly known for many years as "an unknown people in an unknown land." Thanks, among other factors, to the settlements made in the interior by the Mennonites, the land and the people are no longer mysterious or unknown. As to resources, the Chaco is known for its hardwoods, including the Quebracho ("axebreaker") Colorado, from which tannin is made. A few important tannin factories were located on the Paraguay River. Another industry increasingly important and shared by the Mennonites was that of cattle raising. The Mennonites also demonstrated that farming can be carried on with profit in the Chaco, although there are some obstacles. Rainfall, adequate near the Paraguay River, becomes insufficient and uncertain farther west. Because of uneven distribution, the high temperatures in summer, and the sandy nature of some of the soil, the rainfall in the Mennonite colonies, which may vary from some twenty to some thirty inches annually, is at times inadequate for good agricultural production. Another serious obstacle is the grasshoppers. The Mennonites have shown that the following crops can be grown in the Chaco: manioc, cotton, kaffir corn, peanuts, beans, cane, citrus fruit, melons, sweet potatoes, and pumpkins. A few additional garden vegetables and subtropical fruits can be produced in limited amounts. One resource which Paraguay hoped to find in the Chaco, as Bolivia had, was oil. But a very long and intensive search made by a United States oil company was not successful. 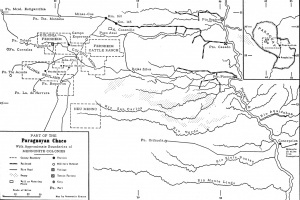 The discovery of oil on the Bolivian side and the coming of the Mennonites into the disputed area were among the many complicated factors which led to the Chaco War between Bolivia and Paraguay, 1932-1935. With the forming of the peace treaty the Chaco boundary between the two countries, for the first time in history, was definitely determined. Menno, the first Mennonite colony established in the Chaco, was founded in 1927 by Canadian Mennonites and is located a little over 100 miles (165 km) west and a few miles south of Puerto Casado, a Paraguayan river port. Menno in 1950 had a population of about 3,000. Fernheim, founded in 1930 by Mennonites from Russia, is located just to the west and north of Menno and had a population of 2,500 in 1950. Neuland, with a similar population, was founded by Russian Mennonite refugees in 1947, and is located some 20 miles (32 km) south of Fernheim. Isolated Mennonite families were distributed in the region surrounding the colonies, engaged in cattle grazing. A few Mennonite merchants were located at Fortin Lopez de Filippis, the center of the Paraguayan government administration, located about 60 miles west of Filadelfia, the capital of Fernheim Colony. After 1943 a mission was carried on in the Argentine (Central) Chaco by the Mennonite Church (MC). Bender, J. E. "Paraguay Calling, Part 1." Unpublished mss., Akron, Pennsylvania. Fretz, J. Winfield. Pilgrims in Paraguay: the story of Mennonite colonization in South America.Scottdale, PA: Herald Press, 1953. Quiring, Walter. Deusche erschliessen den Chaco. Karlsruhe: Verlagsdruckerei Heinrich Schneider, 1936. Quiring, Walter. Russlanddeutsche suchen eine Heimat: die deutsche Einwanderung in den paraguayischen Chaco. Karlsruhe: Verlag: Heinrich Schneider, 1938. Smith, Willard H. Paraguayan Interlude—Observations and Impressions. Scottdale, PA: Herald Press, 1950. Smith, Willard H. "Chaco (South America)." Global Anabaptist Mennonite Encyclopedia Online. 1953. Web. 21 Apr 2019. http://gameo.org/index.php?title=Chaco_(South_America)&oldid=119169. Smith, Willard H. (1953). Chaco (South America). Global Anabaptist Mennonite Encyclopedia Online. Retrieved 21 April 2019, from http://gameo.org/index.php?title=Chaco_(South_America)&oldid=119169. Adapted by permission of Herald Press, Harrisonburg, Virginia, from Mennonite Encyclopedia, Vol. 1, pp. 544-545. All rights reserved. This page was last modified on 12 April 2014, at 05:47.